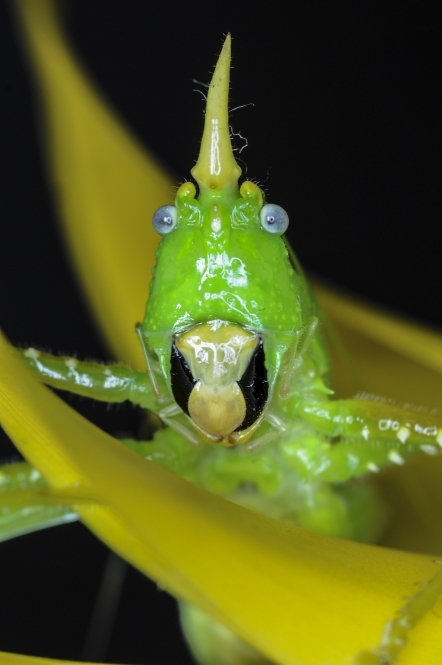 Looking like a character from a classic Saturday Night Live skit, this cone-headed katydid (Copiphora rhinoceros) unsurprisingly gets its name from its pointy-shaped head. These fascinating insects are native to Central America, measure from 3 to 4 inches in length, and have an oversized jaw. Because they are omnivorous, they eat plants and fruits and supplement their diet with insects like crickets and mealworms. This is where their powerful jaws come in handy. Cone-headed katydids may be small but do not be fooled; if disturbed, they are apt to give you a big chomp! Find out more about this katydid and explore the vast collections of the Smithsonian’s National Museum of Natural History by visiting the Q?rius website.